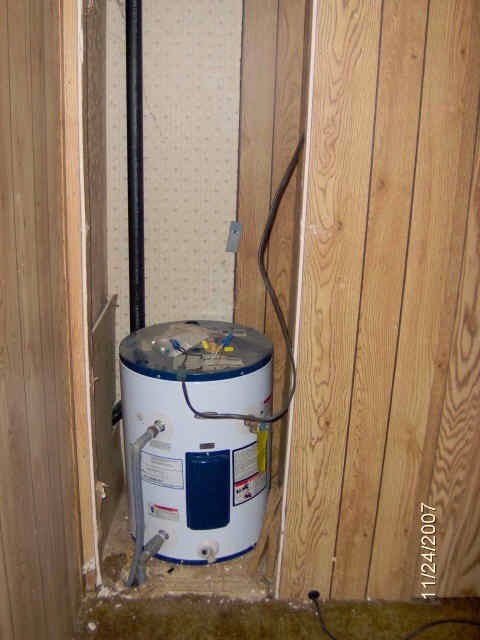 In some cases you can replace an electric mobile home hot water heater with a "regular" home type. Check your local codes. If you are replacing a gas water heater I recommend using a HUD approved type made for a mobile home. You will notice that the difference is that the cold water inlet and the hot water outlet are on the sides of a mobile home water heater as opposed to the home water heater type that are on the top. (Do not use PVC on a water heater repair, CPVC only, PVC plastic water pipe will not stand up to hot water.) Extend the cold and hot line to reach to the top with couplings mentioned in the polybutylene plastic water pipe section. If you have the PB pipe you can convert to CPVC for your repair, look at plumbing repair for couplings to do conversion.. This will require the purchase of couplings, elbows and the proper plastic pipe cleaner and plastic pipe glue for the CPVC. Be sure to read all instructions for the glue and the new water heater. It is a good idea to allow any glue to dry for the maximum amount of time recommended on the can. Be sure that the new water heater is the same voltage and current rating of the the water heater electric circuit now in place or upgrade to match the new unit. Remember to turn off the water supply and power before you start. If there is no cutoff valve on the cold water line at the water heater this would be the time to install one. You can repair the old water heater problem. The problem I often see is the bottom element burned out, if you have a two element system. There are different types of water heater element mountings. These are screw in or bolt on. You may have to get the proper type of tool to get the elements out, this looks like a giant spark plug wrench socket. If the water heater is old I would recommend replacing it. Newer water heaters are much more efficient than ones from just a few years ago. There are computerized units that can think and even diagnose water heater repair problems. The other problem I see is water heater thermostats. These can be tricky to troubleshoot. If you don't replace the unit it would be a good time to flush out the old water heater to clean out lime, rust and etc. Since you will need to drain it anyway to change the heating element. You do this by attaching a garden hose to the spigot at the bottom and running water through the water heater via the still attached cold water line until the out going water is clear. 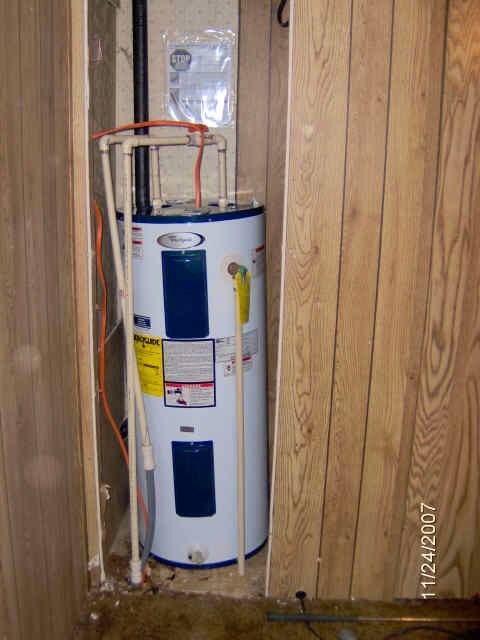 Below is an example of replacing the mobile homes water heater with a standard home water heater. Be sure the electrical supply is adequate for the water heater. The electrical supply was changed from 20 to 30 amps 240 volts with #10 wire and a double pole 30 amp breaker in the pictures below. Note: The customer did not want the floor repaired the unit leveled or a drip pan installed in this picture, against my advice. Below are two diagrams of the most typical water heaters used in mobile homes. The first diagram shows a 120 volt single element unit that were used in older mobile homes and were usually in single wide mobile homes. The second diagram is for a 240 volt dual element tank that is the most common type used in site built homes and modular homes also. Insulating your water heater can be a great way to save energy and reduce wear and tear on your homes water heater elements or gas bill. I have two pictures of insulating techniques. One is for electric water heaters and one is for gas water heaters. I also recommend that you insulate the pipes leading into and especially out of the water heater. Radiation cooling of the hot water out supply water lines accounts for a lot of loss. You can use foam insulation pipe sleeves that are available at any home supply store. Follow the water heater insulation manufacturers instructions. Insulating can cut down on your repair problems because it won't have to work as hard, saving you money all the way around. Timer switches are a great way to save money. Not only does it cut down on the wear and tear of your water heater elements, the timer reduces the on time that your water heater may be heating water when it is not needed. To install these is quite simple. Be sure to choose the one that matches the voltage and current rating of your water heater, either 240 volt or 120 volt. Most water heaters are 240 volt 30 amps. Below are some pictures of the type that I have used in my homes. The installation instructions are printed on the inside cover. Turn off the power at the breaker box and confirm that it is off before working on the water heater. Simply cut the existing wiring and place the box in the middle of the circuit. When I got my timer box (8 years ago) it was about $20.00, I think the price has probably gone up since then, however it won't take long to get payback from the energy savings and water heater repairs. I have mine set to come on twice a day for 2 hours. If you need to over ride the time you simply push the timer over ride button. It takes about 30 minutes to have hot water if the the tank is completely cold in most cases. The timer function then will automatically resume as it cycles around. Every water heater contains an anode rod, which slowly depletes while protecting the tank from corrosion. Water conditions will cause a reaction between this rod and the water. Using a good whole house filter can greatly reduce contaminants in your water supply before it gets into the cold and hot water system. When the anode rod is depleted, the tank will start to corrode, and cause a leak to develop. A common complaint associated with the anode rod is a rotten egg smell produced from the presence of hydrogen sulfide gas dissolved in the water. Using a water softener may decrease the life of the water heater tank because sodium ions are substituted for magnesium and calcium ions and is very corrosive. The anode rod should be removed from the water heater tank every 3 years and checked. If the anode rod is more than 50% depleted replace it. The anode rod is accessed through the top of the water heater underneath a cap. Remember to turn off the power and water supply! In mobile home manufactured homes the spots you want to check for signs of pipe leaks are around the cold water inlet, the hot water outlet, and around the elements. If you do not see any leaks around these areas then you can only suspect that the internal tank has developed a water leak in which case the mobile home water heater needs replacing. Be sure to repair any floor damage before installing a new water heater. If and when the mobile home water heater finally dies, consider what is called a point of use or tankless water heaters. The price on tankless heaters have come down a lot. This will mean however that power must be pulled into each location. Tankless water heaters also require more maintenance than standard hot water heaters, most manufacturers recommend flushing them on a regular schedule. Do your homework and I think you will find the overall savings and added value will pay off. Instant hot water is nice to have!